TB List.Make is a feature packed and easy to use one-in-its kind shopping list. Whether you are on the go, shopping at your local grocery store, shopping at the mall or planning to go to gym, you can use TB List.Make to keep track of all items that need to be bought or checked. 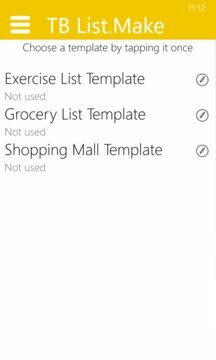 TB List.Makea pp includes a robust engine with built-in templates such as shopping list template, grocery list template, exercise list template. Built-in templates improve your user experience and simplify your shopping process by managing list items just with a single click. 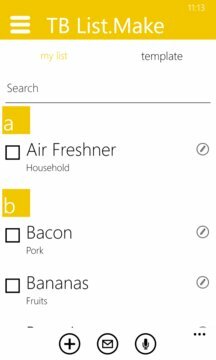 This app will greatly reduce the amount of time spent creating shopping lists, grocery lists, work out lists or any other list you may want to create. ⤇ Priority Support & Missing Feature Requests. We carefully evaluate request from our users in include valuable features into application roadmap.